I was going to title this post 'Groove is in the art' but I figured 1) you all don't need more hints about exactly how old I am and 2) you deserve to be spared from my puns. You're welcome. But, as it says, I have my crafting mojo back. I think I needed the mini break, because I've really been enjoying playing with dyes and my wheel and needles this week. Sometimes you have to refill the well of creativity, as they say. Mine is currently pretty full, I think. That's sort of a tease, because I'm not actually going to show you pictures of new items I've dyed. Well, not mostly. 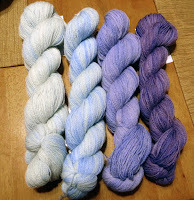 What I am going to do is show you inspiration pictures *for* some of my dyeing this week. Why? Not long after I opened up Creature Comforts in earnest last year, I heard about the Phat Fiber group. If you haven't heard of it, and you spin or knit, you're missing out! 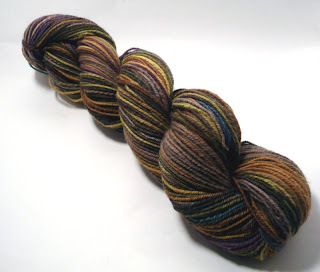 The Phatties, as we refer to ourselves, are a collective of indie dyers, spinners and yarnistas who put together sample boxes based on a theme each month. You may get roving or top samples, yarn samples, stitch markers and other notions and certainly a lot of discounts in each box. Fair warning, competition is *fierce* for these boxes, but they're well worth it. 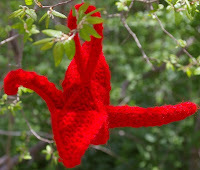 Check out the group on Ravelry if you have an account there to see the amazing things my fellow Phatties can do. Tempted yet? Check my shop mid-April or so and you can see the real things! Good news! I finished plying up the Southern Cross Fibre that I posted about a couple of weeks ago. As I said on Twitter yesterday, I very often start spinning fiber thinking, "eh, I could sell that" and end up wanting to keep all of it by the time I've finished. 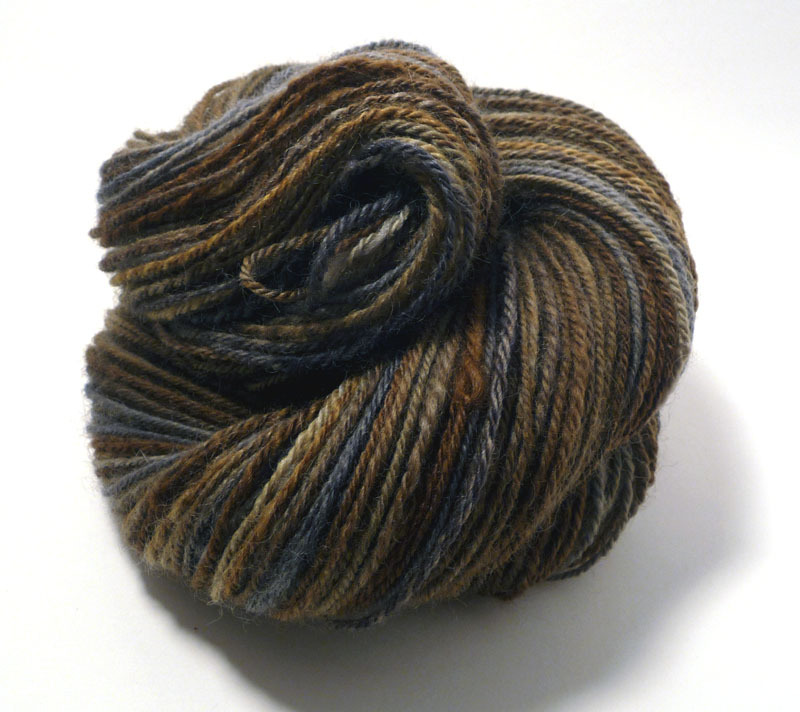 It's no different with this skein. I was very surprised by how much the Norwegian softened up after a good soak and thwacking, and also by how the colors went from sort of dull and drab to almost metallic at the end. This is pretty, pretty stuff. I am, however, going to put this in the shop very soon. It's about 200 yards, and a little over 4 ounces at 10-12 wpi. Plenty to make something fun! This week's knitting project is one that I've been working on for a while. I think I confessed that I'm not the world's fastest knitter. If not, well, there you have it. 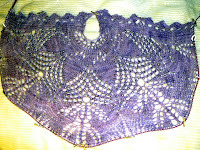 This is the Radiance Shawl by Helen Stewart. 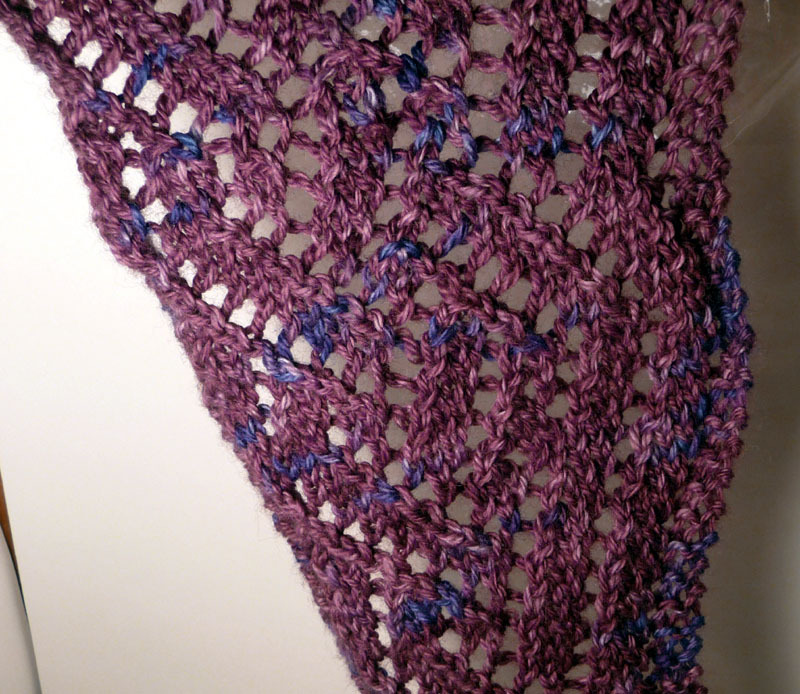 It's a semi-circular shawl which is just what I was looking for when I cast on to escape a forest of triangles. And it's a fun pattern, switching up the design often enough that it doesn't get boring. The problem, as with any shawl pattern for me, is when the rows start to get up there. I'm currently sitting at 256 stitches per row. I will soon be moving up to 500+. That means knitting on this just gets slower, but I'm chugging along. I've just passed the 60% mark. I will finish! The yarn is some KnitPicks Bare laceweight that I dyed myself. The stripes both surprise and please me. And that's it for another week. Thanks for stopping by, as always, and please be sure to come back next Wednesday to see what's new in my world. Week 4: The 80s ate my mojo! It's week four of the bl--wait. Week Four? I've been doing this for a month already? My, how time does fly when you're having fun! Welcome back, if you've been here before. 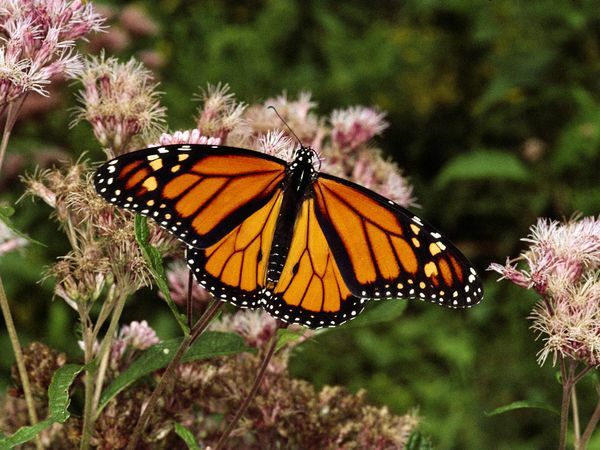 Thanks for stopping by if you haven't. This week, the big news is that I'm back from vacation! For my birthday, the boy and I made plans to go see Bon Jovi in Las Vegas. That happened this past weekend, so he, I, and a couple of friends went and had a fantastic time! We walked far too many miles (quite literally! It's a couple of miles one way between some of those hotels. ), stayed up too late and had a lot of fun. And Bon Jovi is still every bit as much fun to listen to, and even more fun to see, than they were 28 years ago. Oops, I think my 80s are showing! This means, however, that I'm a little light on other content to show you. I took a mini break from dyeing and spinning and whatnot. I did take a knitting project with me (the Andrea Shawl designed by Kristin Kapur) but it's not really far along enough to show off. That starting edge is endless miles of lace knitting, and while I'm about 75% done with it, it doesn't make for an exciting picture. I haven't finished plying the Sturt from last week. The spinning I'm doing now is not yet picture worthy, and overall, yeah. I really don't have anything to show. 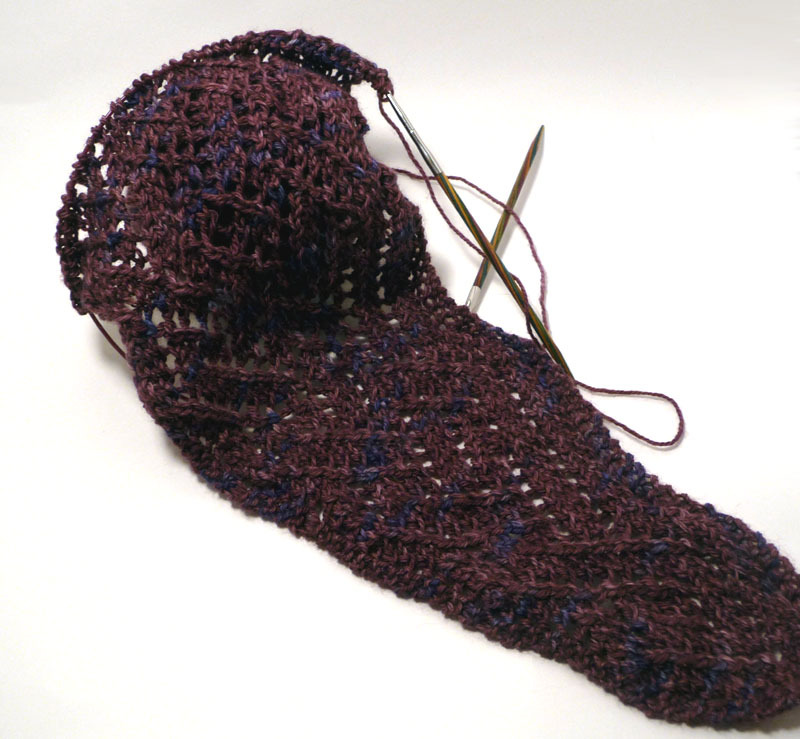 I am currently test knitting a pattern for Gari Lynn. 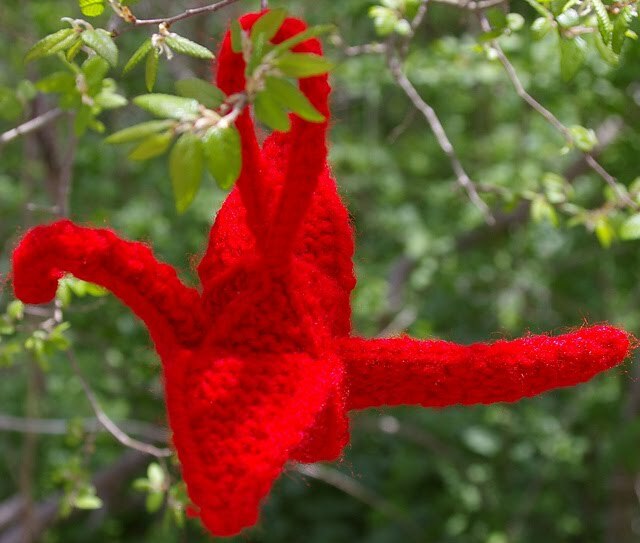 It's a knitted crane, inspired by Japanese relief efforts and the legend of the 1,000 cranes. It's available for sale on Ravelry right now, but the pattern is simultaneously undergoing, as said, test knitting, so if you buy it, be prepared for updates. That said, it's a fun knit so far. And here's a picture of Gari's finished crane, just to tempt you. I will post again next week, if not before, and I promise to have something to show you. Cross my heart. Until then, I'm off to spin and listen to more Bon Jovi! Sort of a late post today, for which I apologize. I was busily, as the post title says, getting organized and then trying to finish up one last bit of spinning and the time got away from me. All fixed, here I am, and there you are, and we are all met. So! This week has been all about getting organized for me. In our house, we have a bedroom that was designated as my craft room. My sewing machine and various other crafty things were stored there. Well, over the years that we've lived here, it has slowly but surely turned into the "crap" room, meaning that things we wanted to move or just didn't know where to put ended up in there, as well as my ever-growing supply of craft stuff. This has become a problem, especially since I got into spinning and then dyeing my own fiber and yarn. There is too much stuff all over the house and this room was out of control. So. The Engineer, my husband, and I took a trip to Ikea after some discussion, and came home with organizational supplies. I have a lovely new bookcase and 4x4 divider from Expedit and decluttering the craft room proceeds apace. I'm actually excited about this, and I am not Suzy Homemaker. Cleaning is not one of my happy things. This, however, is kind of fun. I promise to take a picture when everything's filled and tidy. Right now there's lots of empty spaces and it's very much a work in progress. There will be no "before" picture. I wouldn't have shown that to anyone. We're getting ready to head to Vegas for a weekend of fun (and seeing Bon Jovi in concert! 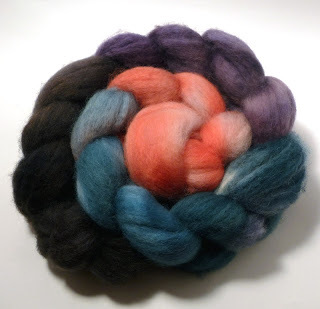 ), so I haven't done a lot of dyeing this week. Anything I dye has to hang to dry and I don't really want to leave it in the house alone with my ADD/OCD cat. I didn't promise to show you the brand new stuff anyway, did I? So I'll share one of my older favorites. 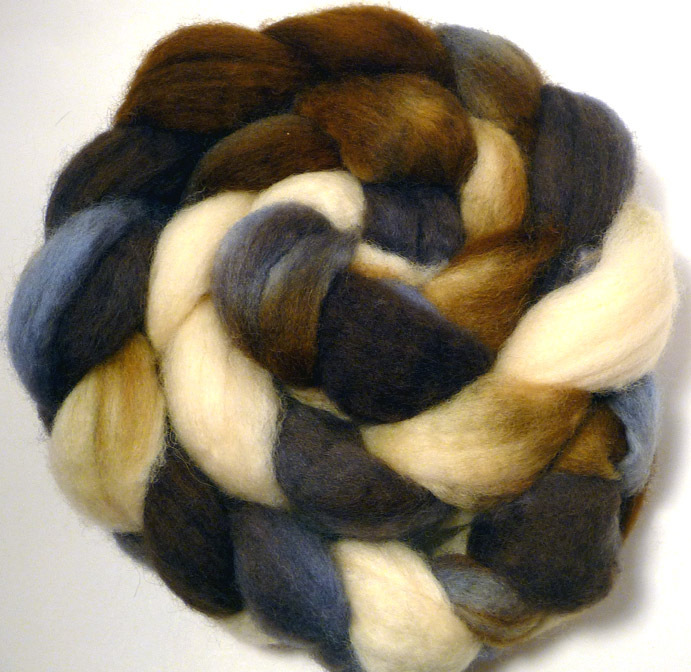 This is a colorway I call Snowshoe because it reminds me of a Snowshoe cat. This particular bump is about 4 ounces of blue-faced leicester, one of my favorite spinning fibers. I love the fact that it's full of fluff and has a little bit of crimp. 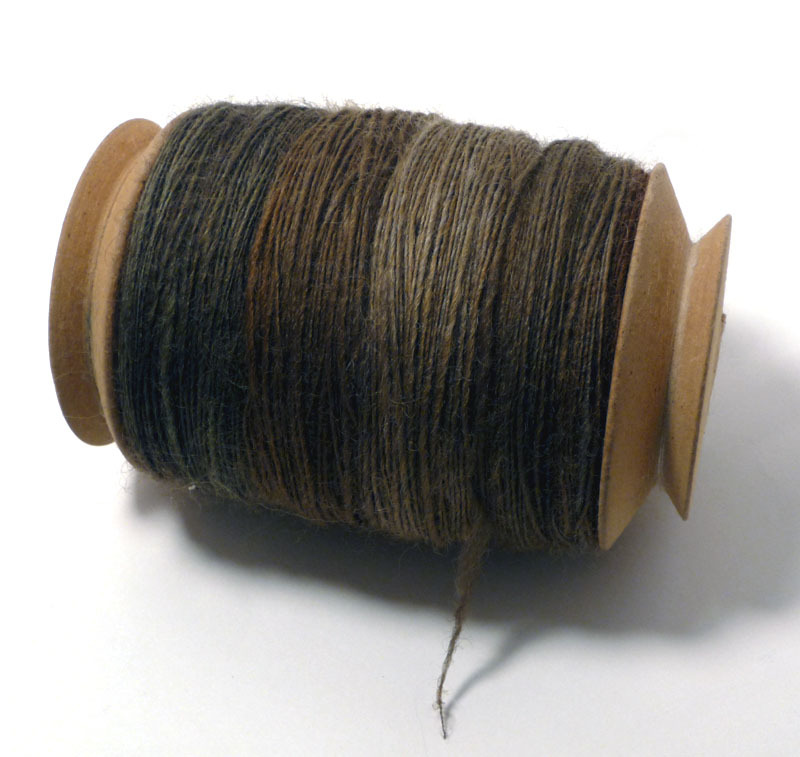 It's easy to spin for me, and fun, and I love the resulting yarn. 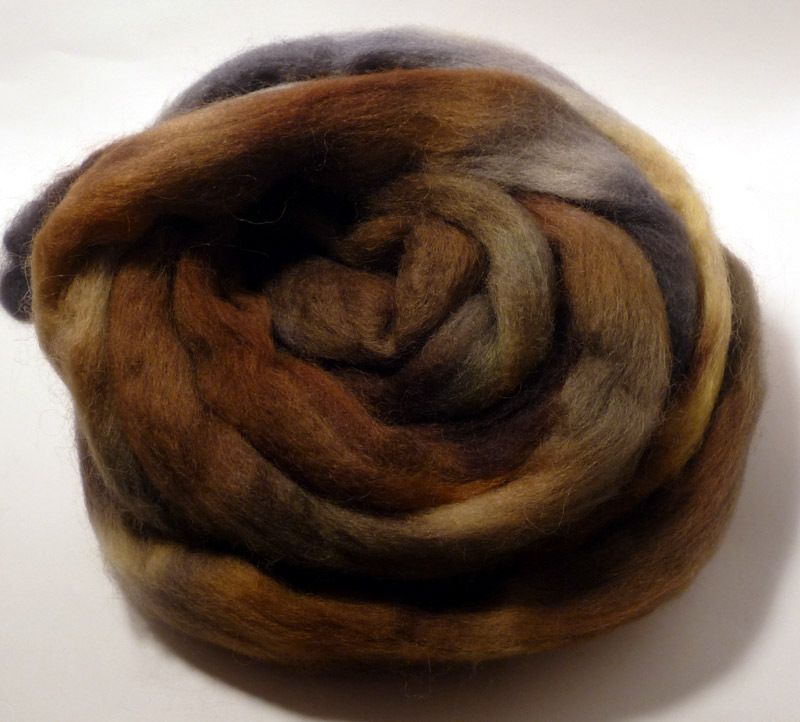 This week's spin is a fiber that I have never spun before. I got this particular bump of fiber from David at Southern Cross Fibre. David has an amazing colorsense, and his fibers (or fibres!) are very well-prepared, and a joy to spin. Even this one, which is Norwegian wool. I did not realize that this is meant for things worn further away from the skin. I do now. Norwegian is not particularly soft, certainly not next-to-skin soft. It felt a bit coarse and wiry to me, not unpleasantly so, but definitely more geared for rougher use and wear. I'm glad I tried it. And I really like the colorway. Most of David's stock colorways come from landmarks and places around Australia, or native flora and fauna, as I understand it. In this case, this colorway, Sturt, was named for a place in Southern Australia, named after Captain Charles Sturt, who was an explorer. At least, that's what I'm guessing. I could be wrong. Maybe it's named after the man. Maybe it has nothing to do with either. It's a lovely colorway anyway. I haven't plied the yarn yet, but I finished spinning it today. We'll see how it turns out. 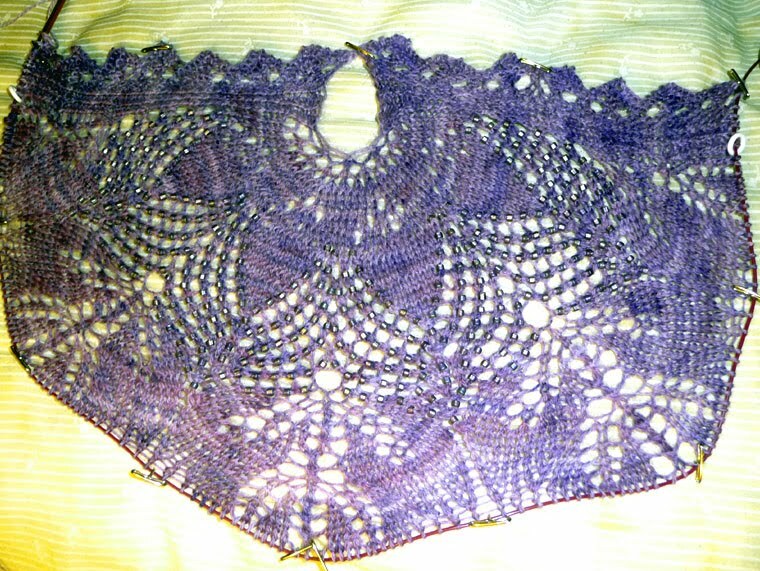 I managed to finish the first clue on one of the (many) mystery shawls I'm working on at present. This is the In Dreams shawl, part of Susan Pandorf's Lord of the Rings collection. 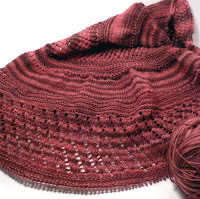 If you're on Ravelry and you've seen the gorgeous Evenstar shawl in people's projects, this is the same series. I intended to knit that one, but discovered I wasn't quite ready for lace yet. This year, I feel more confident, so I'm giving it a go, but I'll tell you, it's still a challenge. That said, I'm pretty pleased with my progress. I'm taking my time, so I'm a couple of clues behind, but I'm getting it right, and that's what matters. This is sort of a trifecta for me, as well, because I dyed the yarn myself and I'm adding the 5000(!) beads as I go along. It's going to be amazing when it's finished, but here's where I am now. And please forgive the not-so-great pictures. In progress shots are rarely glamorous. And that's all for this week. I think that's enough blabbing on, don't you? I may do some excited squealing over the weekend about Vegas and the concert on Twitter, so if you want to read that, feel free to follow me. Other than that, see you next week! Week 2: After the birthday! Hello, hello hello! Welcome back if you've come to see (read!) me before, and hi there to anybody visiting for the first time. Be amazed and awed, I'm managing to post for a second week in a row. Well, be amused, maybe. I can handle the amazed part. I am notorious for thinking something's a good idea and then rethinking it until I don't want to do it anymore. I have been looking forward to Wednesday since -last- Wednesday though, so that seems like a good sign. As the title states, it's now After The Birthday, or 364 days until the -next- celebration. Though technically I guess it's still 365, as next year is a leap year. At any rate, it was a good day! I got lovely gifts from my mother, lots of birthday wishes from my friends, and had a fantastic night out with the DH. My real gift comes in a couple weeks when I travel to Vegas to see Bon Jovi with him and a couple of friends. I'm so excited! And truly a child of the 80s. But let's get to the good stuff! I am still obsessed with lace and I don't see that stopping any time soon. I'm having such a good time dyeing lace yarns that I have considered doing nothing else. I think that's a little too limiting for me, though, so never fear, rovings and sock yarn will be coming in the future. As a matter of fact, I'm getting -back- into sock yarns, since I haven't done much of that for a while. This week, though, I'm showing off my current favorite of the lacey crop. This skein of laceweight turned out such a luscious shade of green that I just love it. I feel a little sheepish bragging on it so much, but I really do think it's beautiful. I call it Picnic on the Lawn, because it reminds me of thick, soft early summer grass, perfect for spreading out a picnic blanket and spending the day. 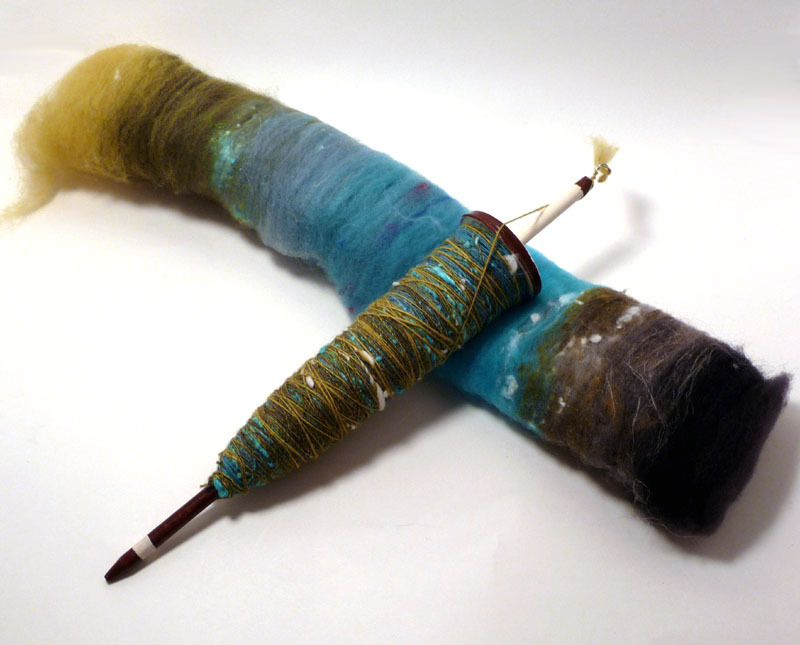 Like a lot of spinners, I started out with a spindle rather than just leaping onto the wheel. I wasn't sure I'd like it or be able to figure out how the whole spinning thing work, so I ordered a few spindles, learned to make my own and ...well. I haven't looked back. I still love my spindles as a matter of fact and have almost every one I own loaded up with fiber of some sort. My current favorite thing to spin are Moonrover Batts. Lacey cards up these fantastic batts from a variety of fibers in amazing colors and then combines them in ways I would never imagine or put together for myself. She has batt clubs where you're guaranteed to get something amazing once a month, but she also puts up one of her limited numbered series or mystery batts in her shops. They're so much fun to work with and now that I've been introduced to spinning right from the batt, I'm even more hooked. This one is the January Batt Club offering in progress (and the last of the set of batts I got in my 2 ounces -- isn't it gorgeous?) 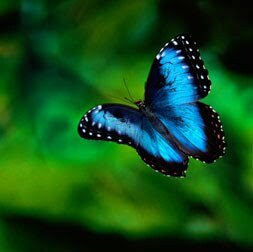 but I have many more to spin in all sorts of colors and I know there'll be more in my future. My startitis continues. I try so hard not to have dozens of projects on the needles at one time, but something inevitably comes along and breaks down all my resistance. Yesterday was no exception. I've been wanting to try colorwork for a while, and have been intimidated by it at the same time. 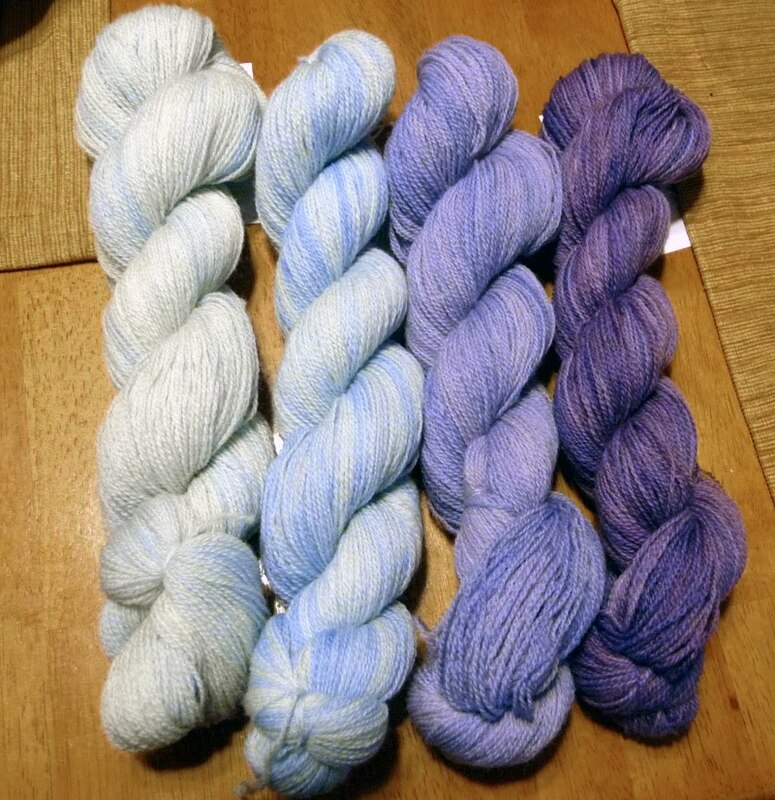 Yesterday, I went to my LYS to get some new needles and ogle yarns I might want in the future, and I couldn't help myself. I picked up some Debbie Bliss Rialto 4 ply to make Eunny Jang's Endpaper Mitts. They're supposedly easy and good for colorwork newbies like me. I've looked at other people's projects on Ravelry and I think I can manage. I hope. I'd cross my fingers but it's tough to knit that way. And that's it! Another week, another post. Back to the knitting. I can hear the yarn calling me. Welcome to March. 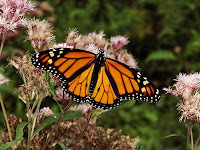 Welcome to my weekly Wednesday postings. Most importantly, welcome to the inaugural post for my new blog, Slinging Stitches! I've been thinking about whether I should kickstart the whole blogging thing for my fibery endeavors for a while. I had a blog, once upon a time, that saw very little traffic, due in part to the fact that I couldn't figure out exactly what to say. I think I've got that figured out now. I hope so, at least, and I hope that some of what I have to say and share and show will be interesting to others. At the very least, it'll keep me honest. I started actively pursuing a place in the fiber business last year, round about May. I've had a couple of hiccups, but I've picked myself and dusted myself off, and I'm determined to be in it for the long haul this time. I'm one woman working out of my home with grand visions of a future that will take a lot of work but has a lot of promise to be very rewarding as well. And I've got stubbornness down. In my other life, I'm a writer. I can promise you that there's very little else that teaches you how to put your head down and keep trying like attempting to start a writing career. If nothing else, I've got a much thicker skin, so if someone doesn't like what's coming out of my dyepots, I can take it! I think! Probably. I figured the best way to let people know what's going on is just to share what I'm up to. That'll change from week to week. I'll probably talk about what's going on in my life. I might share the trials and travails of writing. It all depends on the Wednesday. I'm a huge Shakespeare buff. No, really. When I was twelve, I handcopied the plays, one by one, into wire notebooks because I couldn't afford a collection myself. The librarians loved me. My mother insisted I was the Bard reincarnate. Me, I just liked the stories and the characters and the words. So it shouldn't surprise people who know me that I'd bring this into the fiber world, too. 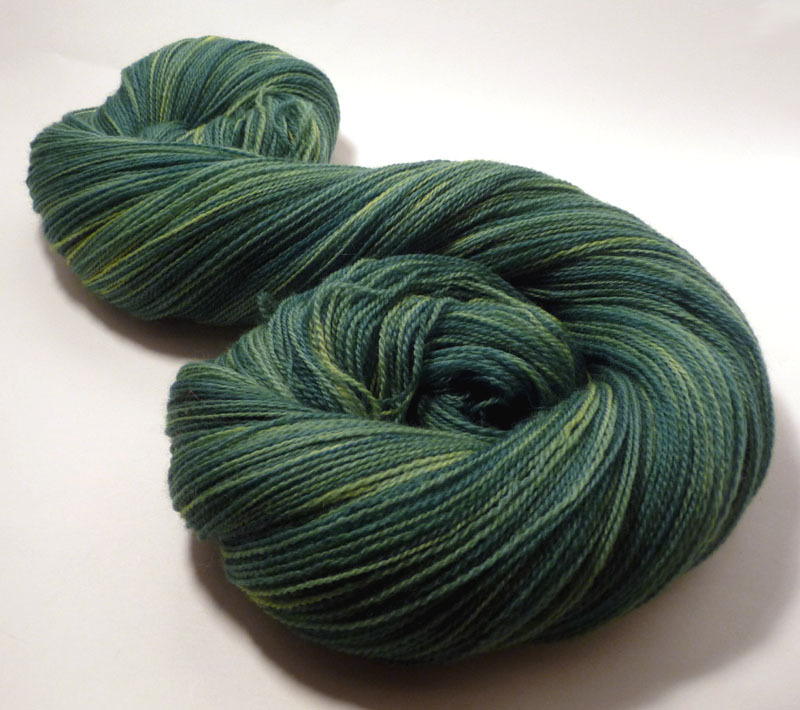 My latest Shakespeare-inspired colorway is Touchstone, based on the character in As You Like It. I figured that with his wry wit, criticism and commentary couched in puns and humor, a few splashes of color with a black base would serve him well. I love it. What do you think? I haven't been spinning for long, but I've made good progress. I started out with drop spindles, and then lucked into a purchase off of Craigslist of an older wheel. (We think it's a Wee Peggy.) It's a little cobbled together, but it does what I want it to do for now. Do I lust after the newer, sports-carlike wheels? Oh, absolutely, but for now, I'm fine with what I have. And we turn out some good stuff. 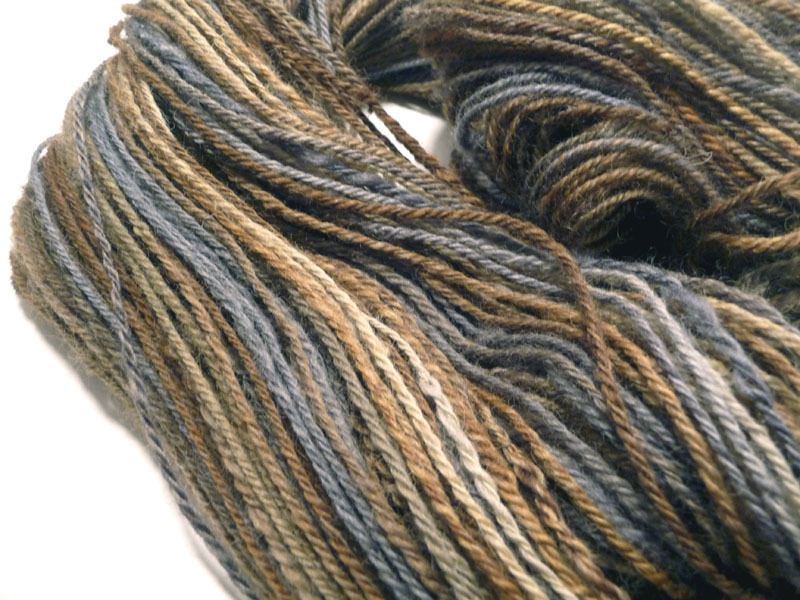 This week, I just happen to have finished a bump of Falkland from Bee Mice Elf. This was a colorway called Dog Days and was a part of the fiber club last year. I'm a pretty slow spinner, and I have quite the stash, but I love Laurs' colorways, so I wanted to spin -something- up. I think this turned out pretty well, and I have a new love for Falkland. Always a plus. That's about 300 yards of 14-15 wpi (wraps per inch) out of 5 ounces of fiber. I chainplied it, so it's not the best yardage I could possibly get, but I am a big fan of chain plying. It's all I ever do. Last but not least, I'm knitting shawls. I have a new obsession both with shawls and with lace, so I've got...way too many projects on the needles now, and more planned for the future. What can I say? Sometimes the ooh shiny factor takes control. This week, I'm showing off the Skuld I'm working on. 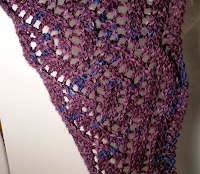 It's a shawl pattern by Anna Dalvi of Knit and Knag Designs and is the last of her series of patterns based on the Norns. I'm knitting this with a skein of Adorn Sock from Three Irish Girls in the Enna colorway. I had a bit of a hard time getting the openwork to show up, but the color's fairly accurate. It's going to be an interesting piece when it's finished. I'm looking forward to it.